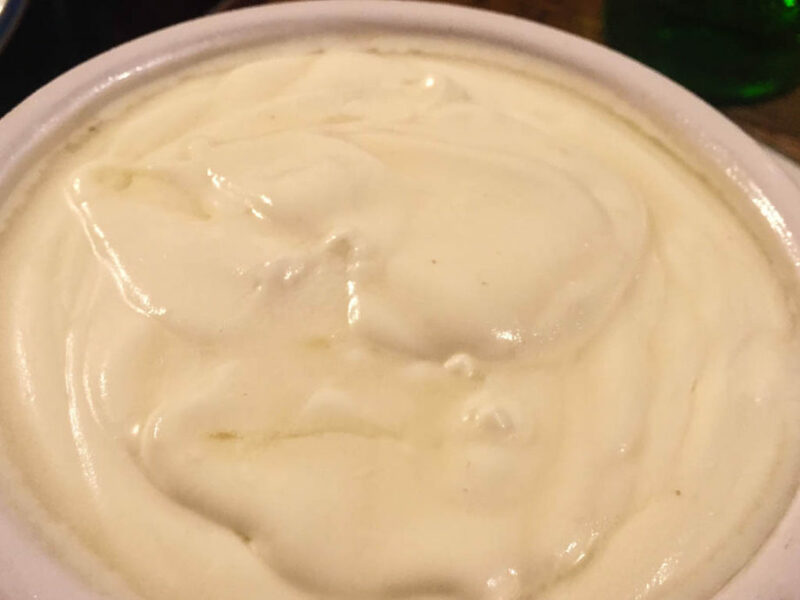 The plan was to have syllabub after dinner on Sunday night, so, Sunday afternoon I decide I’d better get on with it – I know it needs a couple of hours in the fridge to chill. I open up the book to read through the recipe. The first thing I notice are the words “leave it overnight to infuse”. OK, maybe we’re not having this on Sunday night after all, better make that Monday. (Instead, that night, we had a hastily concocted, but delicious dessert of strawberries and peaches with basil, balsamic vinegar and strawberry cream, so that worked out pretty well). So, I get on with the prep. 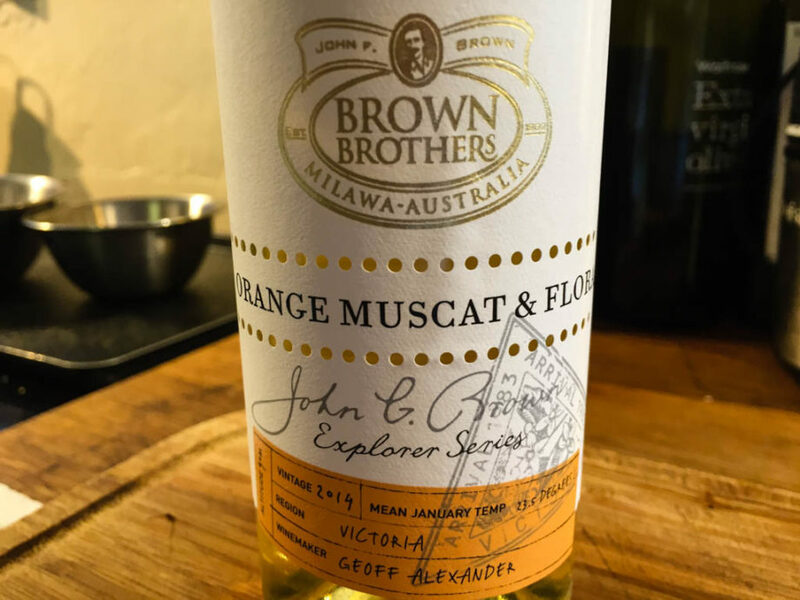 I put a half-bottle of Brown Brothers Orange Muscat and Flora into a pan with some sugar and reduce it. 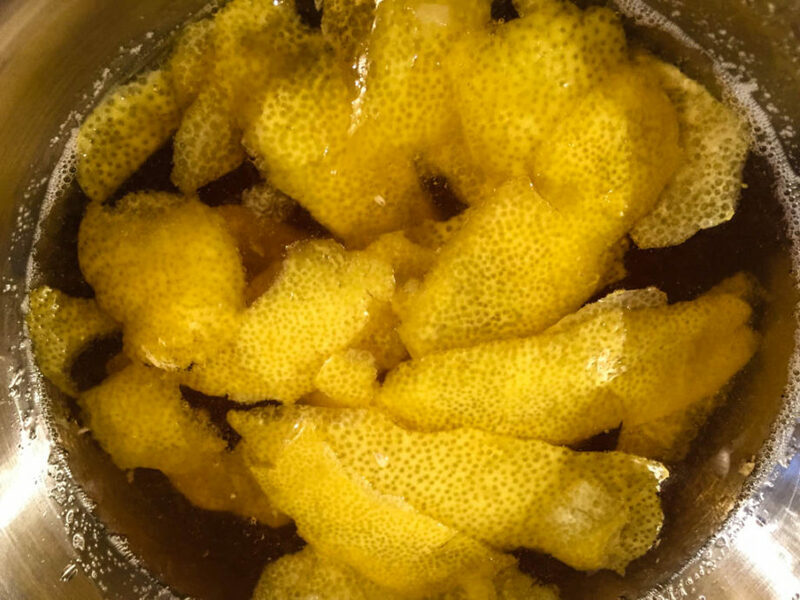 Whilst that’s simmering, I zest and juice a couple of lemons. Once the wine has reduced and cooled, I add the lemon rind, some lemon juice and cognac and leave it overnight to infuse. 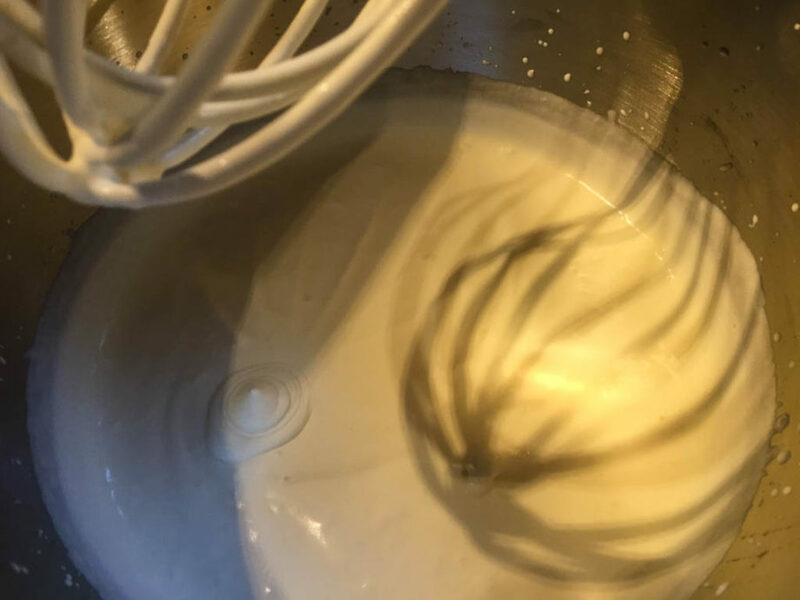 The following day, I strain the wine mixture and put some cream into the bowl of my mixer. I slowly start beating the cream, and add the wine a little at a time. Now, the recipe says very clearly at this point Do not overbeat. OK, but there are very few clues as to what counts as overbeating. What consistency am I aiming for? 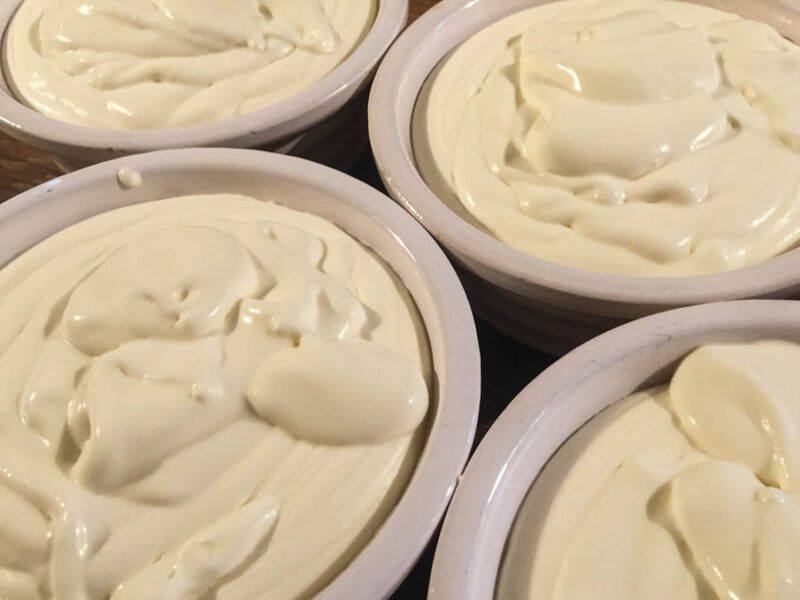 The introduction to the recipe mentions a “creamy cloud of mousse-like consistency”. Well, that’s something to aim for, I guess. I beat it until it is soft and moussey. It’s still a little soft, but I’m guessing it will firm up more in the fridge. And I’m scared of overbeating. I pour it into some ramekins and pop them into the fridge. When we come to eat them, I take them out of the fridge, drizzle a little Limoncello over them, and serve. They are, well, interesting. Very nice, delicate flavour, but way too soft. I quickly tire of eating mine – there’s no texture there at all. I guess I didn’t even come close to overbeating, I should have gone further. I don’t finish mine. There are still two ramekins left, however. So, the next evening, I empty the ramekins back into the mixer, and beat for a little longer. These feel better, stiffer. I spoon the mixture back into the ramekins, and return them to the fridge. Later, when I serve, I top with a little more Limoncello and we tuck in. Same delicate flavour, much firmer texture, but still unexciting. Maybe I could have beaten it further and made it thicker still, but I’m not sure it would have helped. I really do like the flavour of this, but I don’t feel I can eat very much of it on its own – I think it really needs something with it, to add texture and interest. Maybe some fruit, like we had with the Zabaglione would help. This time, neither of us finished. The leftovers are still in the fridge. Now here’s a thought. I have some nice home-made granola. Maybe I’ll stir some of that in and have boozy lemon granola for breakfast tomorrow. I suspect Syllabub is an old English dessert. I've certainly read about it in historical works. I was quite looking forward to trying it. Actually I was quite disappointed. It's a dessert looking for something. A very nice flavour of lemon and a kick of sweet dessert wine. But that's it. No texture. No purpose. It really needs to be served as the cream element with something else like fruit salad or on top of a sponge cake type pudding. I think it might be nice as a trifle topping. But on its own it definitely lacks something. It's texture is very soft and gentle. It separated a bit so that the boozy liquid was at the bottom. We neither of us know if that is supposed to happen. All in all I was left wondering why this dessert was popular enough to come down through time. I think it survived because it has a cool name. Syllabub, It sounds like a character in A Midsummer Night’s Dream. As for texture, during the whole process description I was thinking that it sounded nice, what does it go over, or what goes on top of it. Maybe a sprinkling of finely-chopped nuts? Not too much to overwhelm the dish, just enough for crunch.